Regardless of being a sales team of only one person or one hundred sales professionals, your success is heavily depended on whether or not you have a consistent, scalable and effective sales process in place. We found that many sales organizations, big or small, that struggle in selling either have a sales process that they don’t follow, or they just don’t have a consistent one. You cannot be consistently successful over time without an effective process that is followed by the whole sales organization. This means not just the sales executives, but the managers, sales operations and other sales support teams. However, we also understand that most sales people start to cringe or yawn when they hear the word ‘process’. That is why we have established a fun and effective way to enable sales professionals on the sales process. 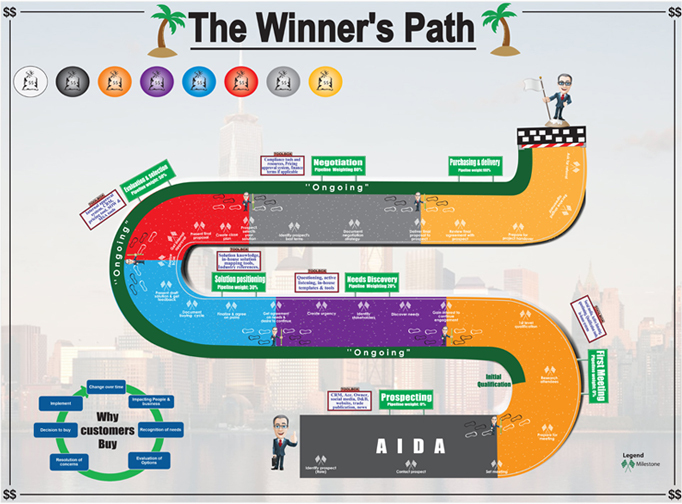 Our comprehensive gameboard formatted sales training workshop , ‘The Winner’s Path’, takes the participants in an end-to-end selling journey that covers every stage in the sales cycle from prospecting to closing the opportunity. Throughout the winning sales path the participants learn about crucial milestones, common challenges and hidden opportunities to better support the client. The Winning Path also covers one of the most crucial challenges in successful selling , effective opportunity qualification, that often results in wasted resources, time and efforts for the sellers. The workshop introduces a tested and proven 6 point deal qualification criteria that allows participants to quickly qualify any opportunity and take necessary actions accordingly.